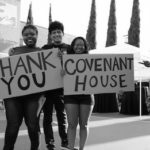 Covenant House California (CHC) is dedicated to serving all God’s children with absolute respect and unconditional love, to help youth experiencing homelessness, and to protect and safeguard all youth in need. They are a non-profit youth shelter that provides sanctuary and support for homeless and trafficked youth, ages 18-24. CHC believes no young person deserves to be homeless; that every young person in California deserves shelter, food, clothing, education … and most importantly, to be loved. Now serving over 2,000 youth a year, CHC has served nearly 190,000 homeless youth since opening their doors. CHC provides a full continuum of services to meet the physical, emotional, educational, vocational, and spiritual well-being of young people in order to provide them with the best chance for success in independence.